Self-contained garden water fountains enhance outdoor living spaces. Setup a compact container water garden on your deck, turn unused deck or porch spaces into an asset with a stylish wooden barrel fountain. 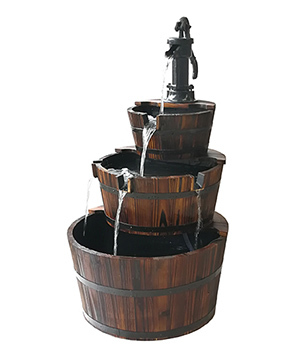 Country-chic design aesthetics of this barrel fountain kit instantly adds charm and personality. Durable fir wood barrel with watertight liner comes complete with submersible pump and hardware for fast and easy setup.